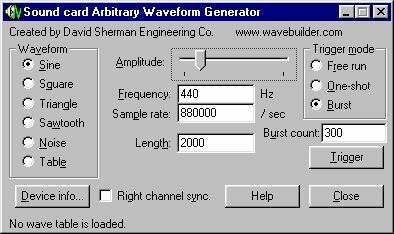 SoundArb is a free program from David Sherman Engineering Co. that allows you to control a PC sound card like you would a conventional function generator. You can select standard waveforms, load arbitrary waveforms from a text wave table file, control the frequency and amplitude of the waveform, and select from a versatile set of triggering modes. With a stereo sound card, one channel can be used as a "sync" output. SoundArb requires Windows 95, 98 or NT, and a 16-bit sound card. You will also need to make a cable to connect the sound card to your test setup. Copyright 2008 David Sherman Engineering Co.